In these pages, we have outlined some of the wide range of treatments which we provide at Quirke Dental Surgeons. If you require further information on any of our treatments, or if you wish to arrange a consultation with us, please contact us on 051-421453 or call to reception. On your first visit to us, and on subsequent check-ups, we will perform a dental health check. 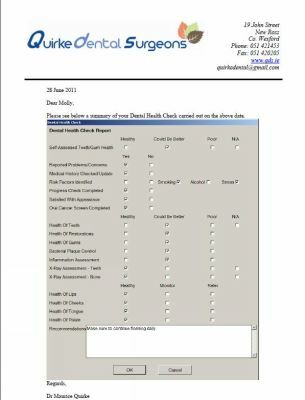 This is a check of up to 18 aspects of your Oral Health and involves a clinical and radiographic examination of all your teeth, gums and all of your mouth.. Having explained our findings, we will give you a written report (like the sample above) on your overall oral health status. This will also include recommendations on things you can do to maximise your oral health. Certain information about the roots of the teeth, the health of the gums and the state of existing fillings can only be determined by the use of dental x-rays, which are often taken at this stage. At Quirke Dental Surgeons we use a digital x-ray system, thereby significantly reducing patient exposure to radiation. Your dental health check also includes a screening for oral cancer, the incidence of which is on the rise. We therefore recommend an dental health check for everybody at least once a year. Regular dental health checks mean that we can spot problems and correct them early before the treatment becomes complicated. A thorough check helps you and your dentist look after your mouth and prevent future problems. We will explain the options and then you can decide together what will be best for you. We want to work with you to maximise your future health. Because the mouth is a region where changes can be easily seen, oral cancer can be detected in its early stages. A detailed dental health check regularly will help in the early recognition and detection of oral cancer, and increase the chance for cure. Studies have shown that the death rate from oral cancer is about four times higher for cigarette smokers than for non-smokers. It is also widely believed in the medical field that the heat generated by smoking pipes and cigars irritates the mouth and can lead to lip cancer. If we detect anything in your mouth about which we have a suspicion, we can arrange for you to see our visiting Oral Surgeon, Mr Nayyar, for a consultation. and biopsy if required. This consultation would take place on our premises. Keep in mind that your mouth is one of your body’s most important early warning systems. Don’t ignore any suspicious lumps or sores. Should you discover something, make an appointment for a prompt assessment. Early treatment may well be the key to complete recovery.